Want to connect with Leonor? Hi there my name is leonor. 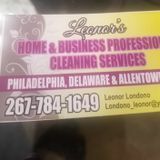 I am seeking a housecleaner job in Philadelphia, Pennsylvania. I hope to utilize my skill as a housecleaner. My availability is flexible. I will take care of kitchen cleaning, dishes, and window washing. On top of this, I have personal transportation available. I have years of experience.